Standard service. We offer next business day delivery of current, dictated notes. These are records sent to us within three days of a patient’s visit. We assign an account manager who will always be familiar with any templates or formats you require, and will remain your single point of contact for swift issue resolution. We offer a one week trial with this service to allow clients to give us a try, without risk. For more information, see One Week, Free Trial. Overflow coverage. We understand how dynamic your office environment can be. Workflows spike and people go on vacation. Even if you’re completely satisfied with your in-house transcription, you may need help from time to time. Our Overflow service allows you to stay current on patient records, worry free. We can set you up quickly and handle all of your overflow work-as much or as little as you need. This service is not eligible for our One Week, Free Trial. Backlog service. From time to time, any office staff can find themselves in a backlog situation that needs to get fixed-fast. 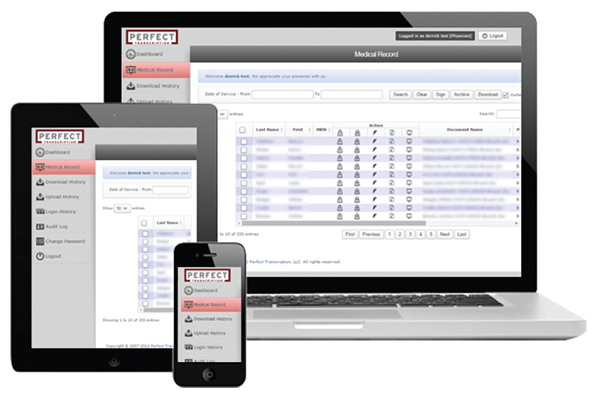 Perfect Transcription can immediately step in and bring your records current. We will assign an account manager, who will commit to a record delivery timeframe, based on the number and size of your records. While every situation is different, most clients can be caught up within about 48 hours. This service is not eligible for our One Week, Free Trial. Affordable. 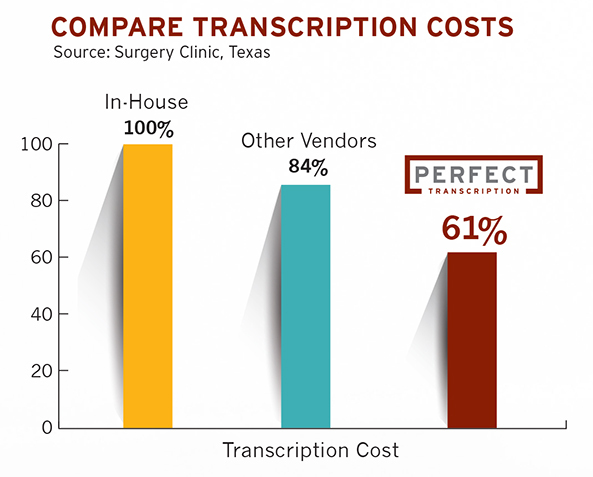 We provide transcription at 10.9 cents per gross 55-character line, saving 40% over doing transcription in-house, and 27% over many of our competitors. Accurate. Physician-owned and physician-managed, so we have the knowledge and experience to meet the needs of your practice. Fast. Online access to transcripts within a business day. Accountable. Your responsive and experienced account manager provides a single point-of-contact who is familiar with your specific preferences. HIPAA Compliance. Security is a top priority. If You Use an EMR, Dictate Instead of Typing. We import your transcripts into your EMR. Without an EMR. Skip the EMR and use our free, efficient document management system. Access past and recent transcripts. Edit documents easily in Microsoft Word, sign electronically, automatically print and fax to referring physicians. View Transcripts Online, Anywhere. Use your computer, Apple or Android device to view notes in the office, clinic, hospital, or at home. One Week, Free Trial. We provide transcription of current notes for one week, for one physician, at no cost or obligation unless you continue using our services. Quick Setup and Efficient Dictation. Physicians dictate with a handheld recorder, mobile device, or via toll-free number. Receive Completed Transcripts the Next Business Day. Automatic printing, faxing, and permanent storage on your network, and/or automated import into our online medical records platform are included at no cost. If you use an EMR, we can import transcripts into it.